The image features a photograph of a real White Raven (also known as a “Spirit Raven” by local Haida people) born in May, 2008 on Vancouver Island, B.C., Canada. He is one of two rare white and 3 black Ravens born to 2 accepting (black) parents. The two rare birds are not albino, but leucystics which is what makes them so unusual. Their eyes are quite blue. All 5 siblings are getting along extremely well and all are thriving. 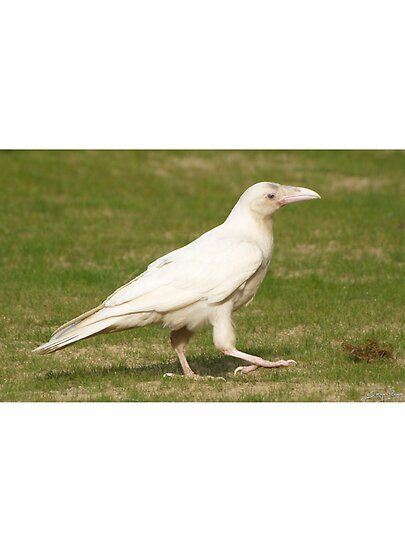 White Ravens are very rare and hold sacred meaning for many groups and cultures throughout the World, including Native American Indian, Celtic, Norse and Wiccans. This artwork is another tribute to these remarkably intelligent and friendly birds. 50% proceeds from all sales go to the Mountainaire Avian Society in the beautiful Comox Valley on Vancouver Island.